Charly is evolving and from now, all business transactions are backed by Hybris Commerce. 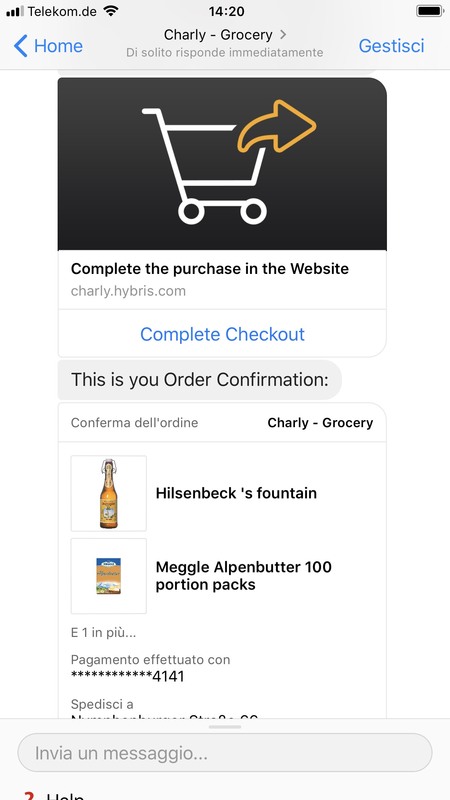 This is the first round of series of upcoming integrations between Facebook Messenger, one of the leading instant message applications, and the core operational system for order and inventory management, made by Hybris. The complete shopping experience can be accomplished almost entirely by chatting with Charly in virtue of the basic interoperability implemented in this release. The entry point for Charly is Messenger. New users can search products and, differently from the previous version, they can comfortably manage their shopping cart without being registered in the commerce’s website. The aim of this change is to reduce the friction in the purchase process, by keeping the user in the chat application as much as possible. 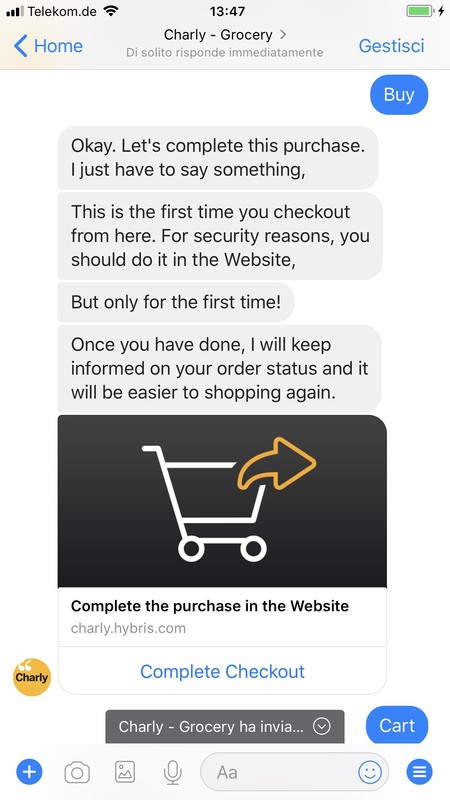 When the user wants to checkout, Charly will prompt him out of the chat, in order to finalize the purchase in the web application. This step is necessary since sensitive data like payment details are managed only according to the merchant’s payment data security standard. User’s utterances are mediated by Facebook, therefore for security reasons Charly won’t manage credit card details. By tapping the banner ‘Complete the purchase in the Website’ the user swifts to the Hybris Commerce checkout page. 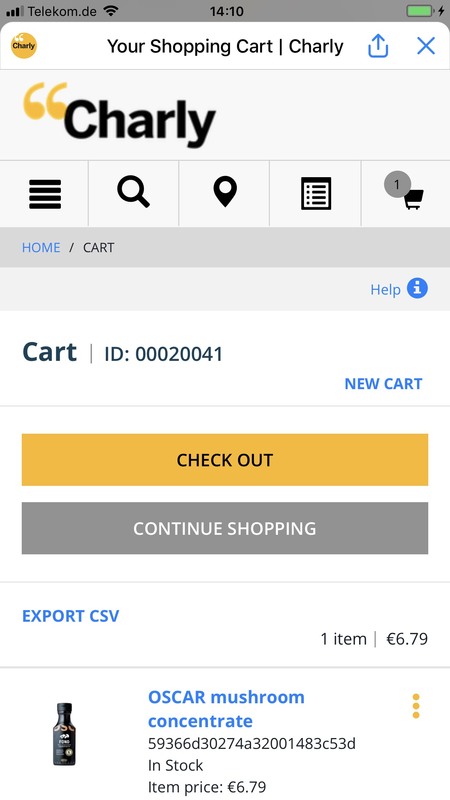 The shopping cart presents the items previously selected in Messenger and the user may register as new user, or complete the order as guest user. The user enters the shipping address, the delivery mode and the payment details according to the use cases implemented in B2C Accelerator. By convenience, a credit card number is already pre-filled in the checkout form. Once the user taps the banner, the web application keep Charly in sync whenever the user perform the registration as guest user, or as fully registered customer. Moreover, the web application notifies Charly every time the user finalize the purchase. As in the previous version of Charly, the user is notified not only when the order is submitted, but also when the order is shipped, as an alternative pushing messaging mechanism other than e-mail. The user has to finalize the order in the web application only the first time. Once the payment details are available in the commerce system, Charly guides the user, without leaving the chat, through its enjoyable checkout process. Please “Like” Charly’s Facebook page to stay informed on news and events!